Yesterday I attended a conference session titled “Facilitating Genuine Dialogue on Diversity While Instructors’ Own Marginalized Identities are Evoked” with Izumi Sakamoto (University of Toronto), Lorraine Gutierrez (University of Michigan) and Billie S. Allan (University of Toronto). I attended a panel by the same presenters a few years ago on “Decolonizing social work curriculum” (I can’t recall the exact title but it was something along these lines). These women are fantastic; Billie began by thanking the ancestors of the land that we were standing on for their gifts which immediately made me feel at home, and brought to mind my first nations colleagues and friends back home. Although there is a plethora of literature on how to teach cultural competency to students, rarely covered is how instructors with multiple marginalized identities negotiate the classroom space and engage students in genuine dialogue on marginalization and privilege. Presenters will share their experiences in navigating through tension and vulnerabilities. The shared experiences were, at times, overwhelming and painful and for the larger-than-expected audience for this session, often times quite emotional. I watched as several accomplished and tenured professors shed tears as they described very confrontational and emotionally violent actions that privileged white students had brought to their classrooms. It is experiences like this when I struggle with whether I want to, or have the energy to, continue to hold ground and/or push on within the institutional and social systems that oppress marginalized communities – and that includes schools of social work and social service agencies. I am fortunate that I have some amazing women of color friends walking with me on our doctoral education journeys but I have to admit that I wish there were more of us in my field. I am concerned that there is a lot of talk about social justice and anti-oppression in social work but in the daily business of social work practice, education, and research there is a surprising silence about confronting the arc towards the status quo. I go to these conferences and have very different experiences that seem to be so dichotomous as to be splitting; on the one hand I can have amazing conversations with radical social workers who speak of decolonizing social work practice while only hours later I’m questioned about my race and ethnicity by a white social worker who thought it was her right to know where I was *really* from (and then proceeded to “guess” based on her ideas about my name). A few weeks ago at the Adoption Initiative conference in New York, I had the luxury of spending several days with deeply thoughtful and intellectually and socially grounded professors, doctoral students, artists and practitioners with whom I could speak deeply and emotionally about the challenges of being in academia as someone who challenges the current operating paradigms. One of the themes that came up was how important it is to take care of ourselves so that we don’t burn out, self-destruct, or lose ourselves in this difficult work. 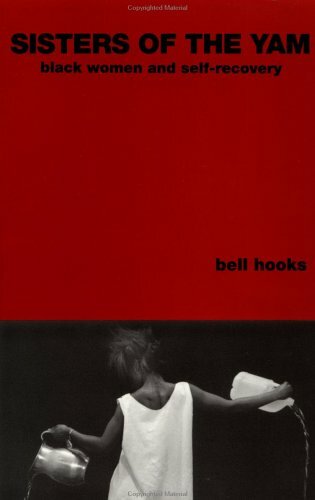 One of my new friends suggested reading Sisters of the Yam by bell hooks. My copy arrived the day before I left for this conference and I had been sneaking in little moments to read over the past couple of days. So when the group presenter asked each of us to say something about how we move forward, I pulled out this book from my bag, and promised that I would finish reading Sisters of the Yam. I mentioned on this blog the other day how privileged I am to be facing these choices; but attending this session also increased my sensitivity to the ways in which people of color or people from other marginalized communities make these choices with much greater stakes than those from more privileged backgrounds. This isn’t necessarily a matter of just making choices; rather if people don’t stay and fight hard to claim a space in the academy (or in the profession) it becomes more difficult for those coming up after to see themselves, as well as perpetuates the hierarchies and gatekeeping that exist. One of the participants of this session I attended mentioned that she carries with her the spirit of her mother, grandmother, aunts and all the other women in her family who came before her who never had the opportunities because they were denied access. I left this session with more questions than answers and more sadness than hope. And this thought: we already know we are strong and capable because we made it this far, even with the many obstacles in our way; the question is, are our institutions, professions and colleagues with privilege strong enough to change the status quo? Perhaps we’ve been asking the wrong people to shoulder the burden of inclusivity and social change.